Dangerous Books | What is ML Reading? It’s Banned Book Week; a week celebrating the Freedom to Read. Be careful! Some picture books are dangerous. You should avoid them at all costs. ML and I tried not to read the books below, but we couldn’t resist. 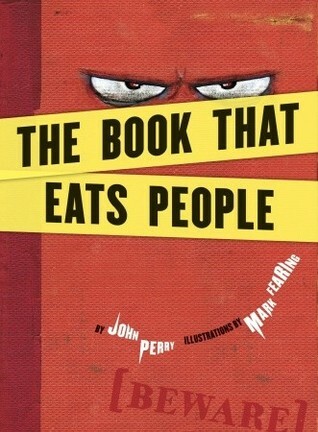 The Book That Eats People by John Perry and illustrated by Mark Fearing title says it all. This book eats people. Not just one person, but many people! It’s a hit with the children of North Carolina. In 2012, they voted it North Carolina’s Children Book Award Winner in the picture book category. 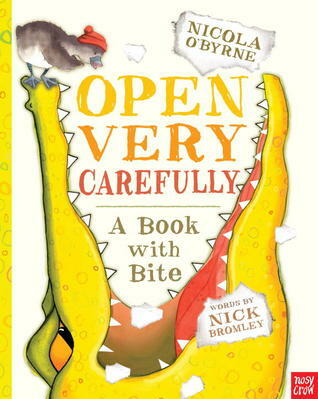 In Open Very Carefully by Nick Bromley and illustrated by Nicola O’Byrne, a crocodile is trapped in the wrong book. Only the bravest should open this book. Thankfully, ML and I braved the book. It’s one of the funniest books of the year. Warning: Do Not Open This Book! narrated by Adam Lehrhaupt and illustrated by Matthew Forsythe warn you in both the title and several pages after to not open the book. But we couldn’t resist learning letting the monkeys out. Stay Tuned! Tomorrow, I’ll highlight some banned or challenged picture books. 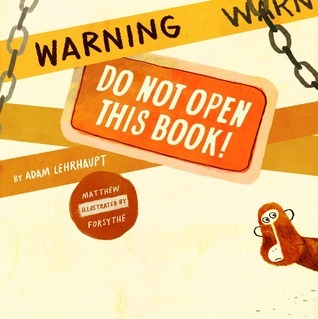 This entry was posted in Picture Book and tagged Adam Lehrhaupt, John Perry, Mark Fearing, Matthew Forsythe, Nick Bromley, Nicola O'Byrne, Open Very Carefully, The Book That Eats People, Warning Do Not Open This Book! by mlreads. Bookmark the permalink. Great post! I’m wondering if I could pull off a banned book storytime, or if that would raise too many eyebrows. It’s always fascinating to see what’s on the list though.